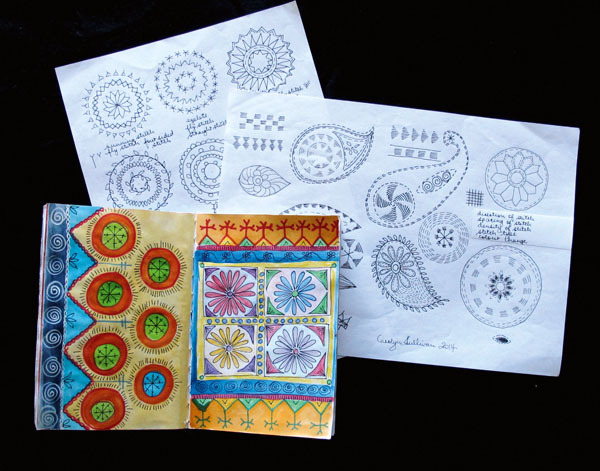 Carolyn Sullivan is the author of many books documenting embroidery and textile designs from all over the world. Carolyn Sullivan’s embroidered and quilted works are inspired by these textiles. In this blog post she tells us more about her inspiration. By Carolyn Sullivan. I have always loved cultural textiles and a lot of my work has been based on the running stitch used in the kanthas of India. I have also used some of the works from the collection of the Embroiderers’ Guild NSW Inc plus some gifts and small purchases I have made over the years as inspiration. As well as the stitch of these textiles, I love the shapes used and the vivid use of colour. Browse our new quilting patterns here! In 2013 I was invited to design a class based on embroidery for the ContextArt event in the Blue Mountains. Since I loved cultural textiles, I used these as the basis of the class. Before the class I made many samples and drawings. 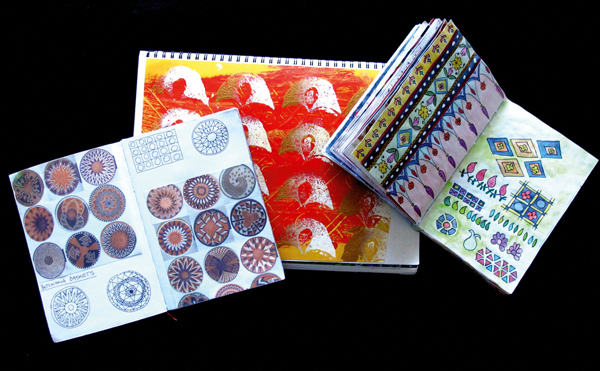 The samples were stitched together into a concertina book that is easy to use in the classroom. The samples are based on many cultures. There is one (cream circles on red) that was based on an embroidery held in a small museum in eastern Europe. Others are based on Afghan or Indian embroidery, and some African inspiration (the red stars on the cream background). All of them have my own interpretation of the source material because often it is too hard to see the original in a picture, or the fabrics and threads are different. These have an impact on how the stitching can be done. Frequently it is better to use the stitches I am familiar with than trying for something that is difficult to see. The other thing that is important is that there is a big difference in the culture from the original stitcher and me, and my stitching reflects that. This was brought home to me really well when I visited the Textile and Resource Center at the Philadelphia Art Museum in 2014 to see seven of the kanthas that the museum holds in its collection. Although I have closely examined those works and taken many photographs, and stitched some of the patterns, the people who did the original works have a very different “hand” to me. For example, I can demonstrate to a group of students and ask them all to do the same thing and there will be many variations on how their work looks. When you add in a completely different set of skills, time and culture, the work will inevitably be different. We love Anorina Morris’ versatile Step in Time Quilt! 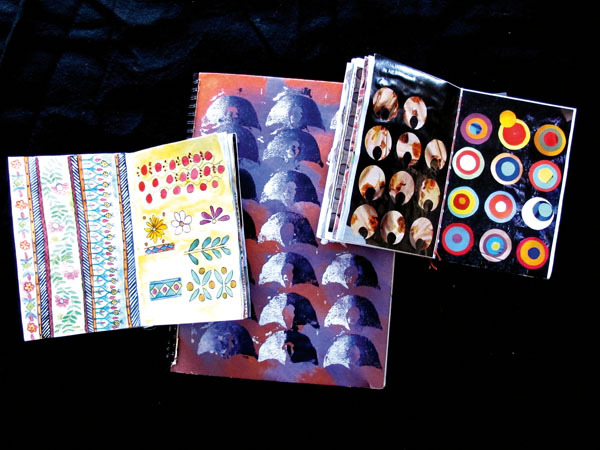 The coloured circles on black in the top left-hand corner were based solely on my love of circles and because I had collected a scrapbook full of images of circles. They are frequently used in cultural textiles. In one of the scrapbooks, I have a series of beautiful images of Botswana baskets that is a fabulous source of inspiration. For each individual sample, I simply drew out the shapes on paper and then used them as templates to cut them out in the fabric. They were attached to the backing cloth and I started stitching. I think because I had done so much drawing before I started sewing, cutting the shapes was instinctive. I have been an embroiderer almost all of my life so I have a good knowledge of stitches and how they might be combined. I also have an excellent collection of hand embroidery threads so the stitching (and a small amount of beading) was fun to do. It was a nice playtime. In 2011, I acquired a needlefelting (embellishing) machine. I have made more than 50 samples (approximately A4) with it since then, trying all sorts of ideas and stitch combinations. Most of those samples have been the basis of my art quilt work, which can be seen on my website (listed below). 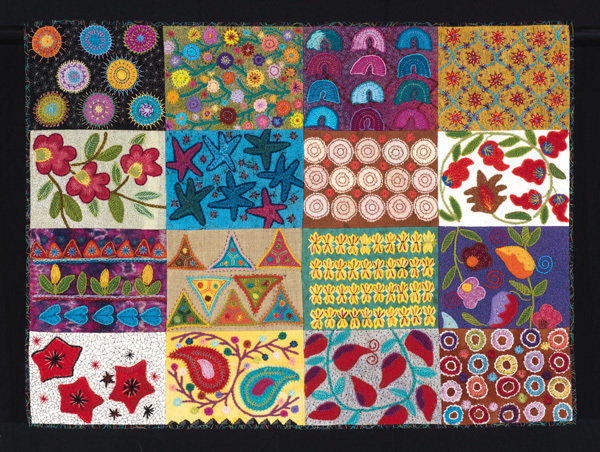 Some of the 16 samples used in the quilt were simply designed for the particular class I taught in 2014. Others were added to make up the number required for the quilt. I have been using a black wool and viscose felt as the base of my work because it is firm but soft enough to sew comfortably by hand. I purchase it at Spotlight. Onto that I embellish a soft fabric – sometimes plant-dyed soft wool (nun’s veiling from Beautiful Silks) that I have dyed myself, dyed butter muslin, silk tulle, and even a beautiful space-dyed scarf that was a gift from my mother. Over the top of that I then place my shapes that are cut from pre-felts. Again I use these because they are soft and easy to stitch through. There is then a layer of wool stitching that is further embellished. The embellishing machine tends to flatten the wool stitching that makes it nice to sew again over the top with cotton threads, usually stranded cotton. Before I start stitching with cotton over the top of all my layers of felt, fabric and wool stitch, I add a backing fabric and the cotton embroidery then acts as the quilting, holding all the layers together. Inspired by Carolyn Sullivan to improve your quilting skills? Browse our online quilting class here! Making the samples up into a quilt was not easy because the blocks were not all the same size. Nor are they now. The second row from the top is slightly smaller than the other rows. There was a lot of cutting down and fiddling to get the blocks to work together. There was also a lot of extra stitching required to make the few more blocks that were needed and adding more to some of the blocks. In constructing the blocks I laid them out on the table in my studio to get an arrangement I liked and then machine stitched each horizontal row separately. Each of the raw seams on the back is covered with fabric strips. I then joined all of the rows together and covered those too before binding the quilt.